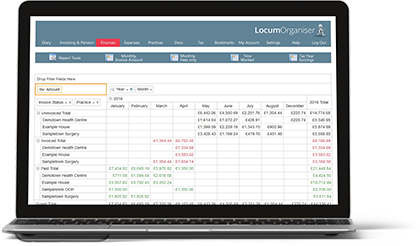 Locum Organiser gives you flexible, clear financial reports, which tell you pretty much everything you need to know – e.g. past earnings, how much each practice owes you, the value of future bookings. There are a number of reports provided as standard, such as a monthly invoicing report (below), your total earnings in the tax year and the number of hours worked in each practice (useful for indemnity cover). These should cover your day-to-day needs. But you needn’t be limited by the standard reports provided – all reports can easily be changed to show exactly the information you need – just by dragging the fields in the report around. You can save your customised reports to see future figures in this format and you can set a starting report which you see each time you log in. Your figures – your way. All reports can be printed or downloaded in several formats including Excel and PDF. 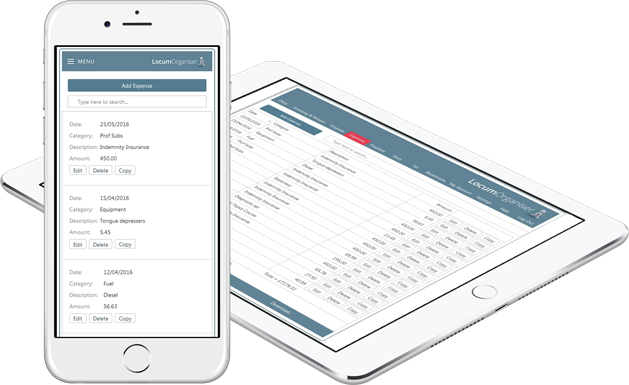 Feedback is consistent in that this screen gives locums a better grip on their finances and makes them feel more in control.